FABULOUS FROCKING SHENANIGANS IN ROTORUA SO FAR! THIS SET THE SCENE FOR THE FROCKS MOVEMENT IN ROTORUA AND INCLUDED A GORGEOUS GUITARIST SWOONING IN THE BACKGROUND WITH A DELICATE MORNING TEA AT CITY FOCUS. AFTER SOCIALISING AND ADMIRING ALL DECORATED BIKES, HELMETS AND BODIES, WE WERE OFF ON A RIDE AROUND THE CITY. TO CELEBRATE BIKEWISE MONTH, ROTORUA FROCKS ON BIKES HAD A RIDE AROUND THE CITY AND FINISHED UP ENJOYING THE SUNNY WEATHER WITH A FROCKNIC. IT RAINED THE DAYS LEADING UP TO THIS DAY BUT THE SUN CAME OUT TO PLAY AND SO DID ALL THE WONDERFUL FROCKERS, OLD AND NEW. WE RODE A CYCLEWAY ALONG A FOUR LANED ROAD AND HAD DRIVERS WONDERING WHAT WAS HAPPENING. ALL THE FROCKS GOT WAVES AND TOOTS AND REPLIED BACK WITH BELLS AND SMILES. THE RIDE ENDED AT THE CAFE “THE OFFICE” THAT KINDLY PROVIDED JUICE AND MUFFINS FOR OUR AFTERNOON TEA……YUM! A LOOP RIDE AROUND THE CITY STARTING AT KUIRAU PARK AND FINISHING WITH CUPCAKES AND BUBBLES (SPARKLING GRAPE JUICE OF COURSE). 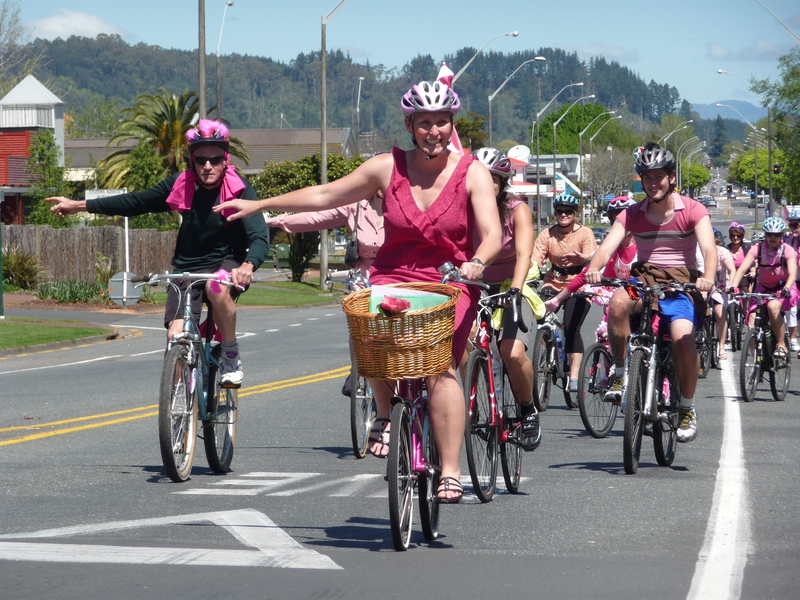 THE THEME WAS PINK SO THERE WERE SOME BRIGHT STYLISH RIDERS. A COLLECTION WAS BE MADE FOR BREAST CANCER MONTH. A very hot day in Rotorua and some slow riding made for a wobbly show off of bikes. There were choppers, raleigh 20’s, tandem and the weird and wacky bikes. Thanks to all that rode on the day! A SCENIC RIDE IN THE FOREST FOLLOWED BY A MORNING TEA PICNIC. 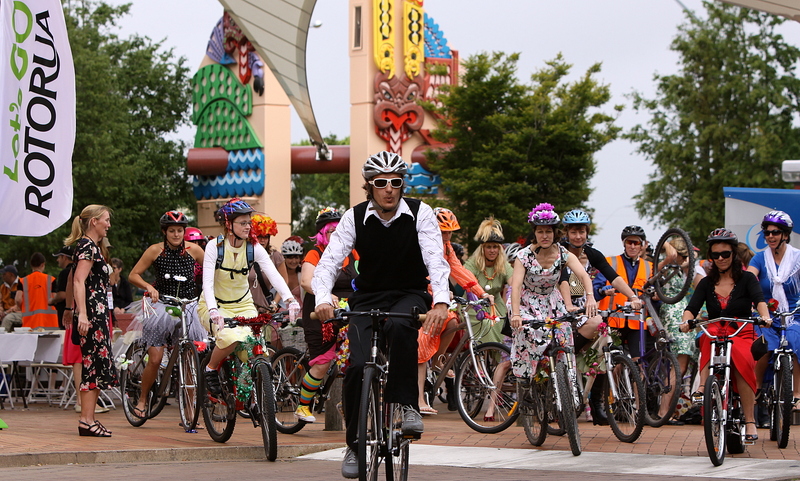 173 PEOPLE TURNED UP TO RIDE ON WAITANGI MORNING….WOW! A BRILLIANT RESPONSE. THE THEME WAS KIWIANA SO MANY WERE DRESSED IN A NZ FLAVOUR WITH SOME ADORABLE PAVLOVAS AND BUZZY BEES. THERE WERE PRIZES GIVEN OUT AS PART OF BIKEWISE MONTH AND A LUCKY YOUNG MAN WON A NEW BIKE. 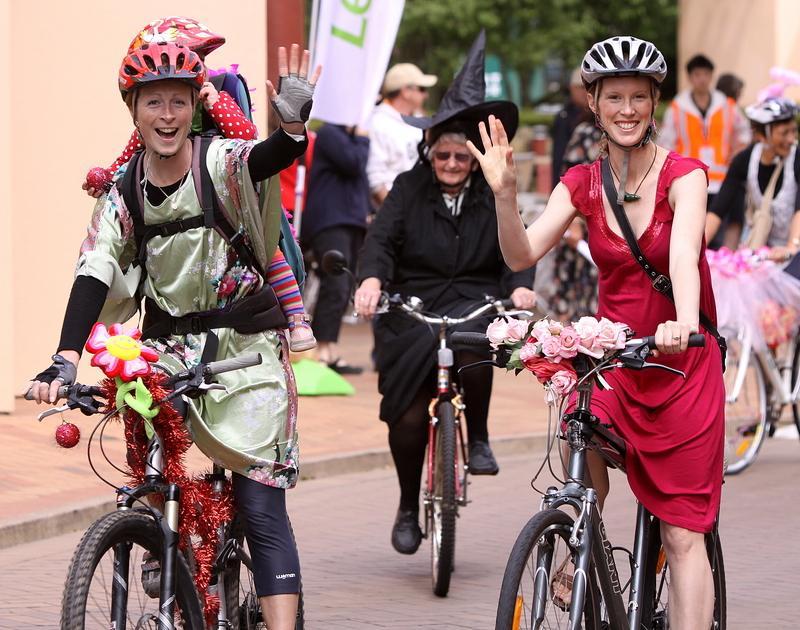 THE PARTY FROCKS ROCKED FOR ANOTHER RIDE IN ROTORUA. ON THE 2ND OF APRIL WE MEET AT THE CARPARK AT SKYLINE SKYRIDES FOR A STYLISH RIDE ALONG THE CYCLEWAY OUT TO NGONGOTAHA. WE ENDED UP AT ESSENCE CAFE FOR FOOD, DRINKS AND SOME SOCIALISING. WELCOME TO THE NEWBIES THAT JOINED US. 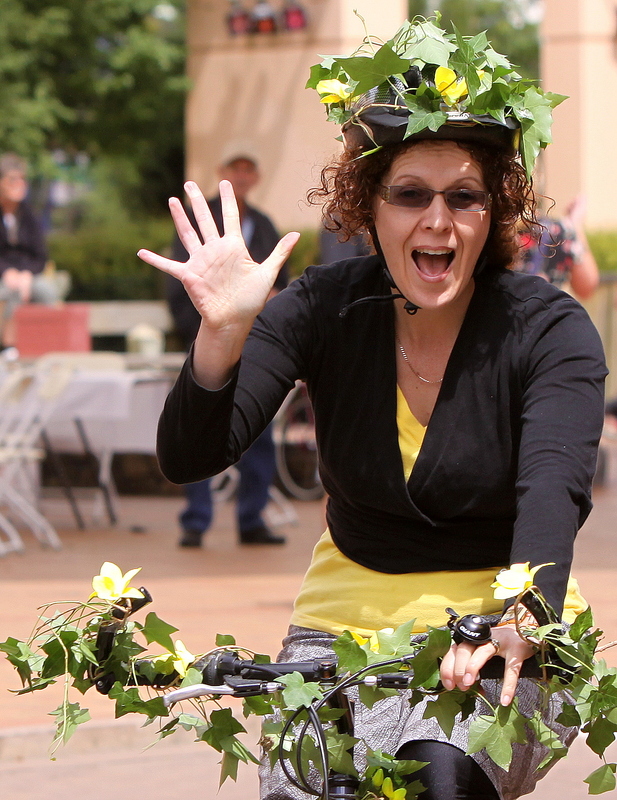 FROCKS ON BIKES IN ROTORUA IS IN FULL SWING! 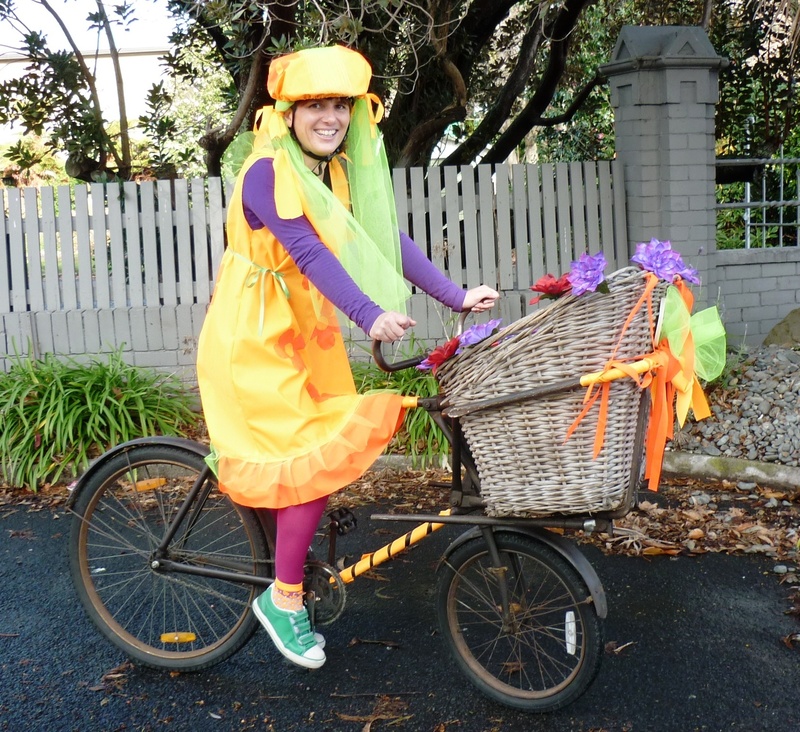 The lovely Natasja has taken over the handlebars at Frocks HQ in Rotorua and has been busy already. Check out the pics from the October ride below, but before you do, book yourself and your loved ones in for a picnic ride on Sunday the 15th of February! This will be on the front lawn at Gardeners Cottage in Government Gardens form 11am – 1pm. 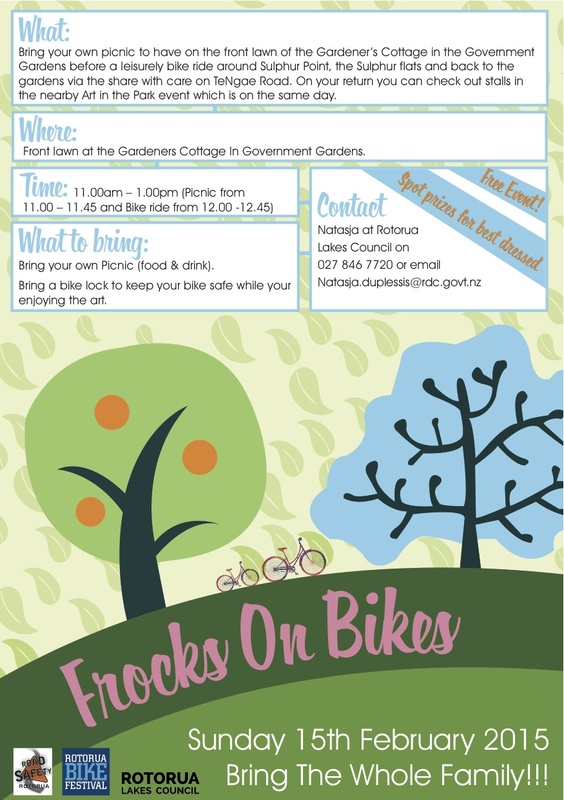 Bring a picnic and your bike! Details below.